Looking for that gift for a friend getting married? I like to get something they really need by purchasing an item that they've chosen off their registry, but that's not always fun either. I do like to make gifts so that the person knows I went the extra effort to make a personalized gift for them. 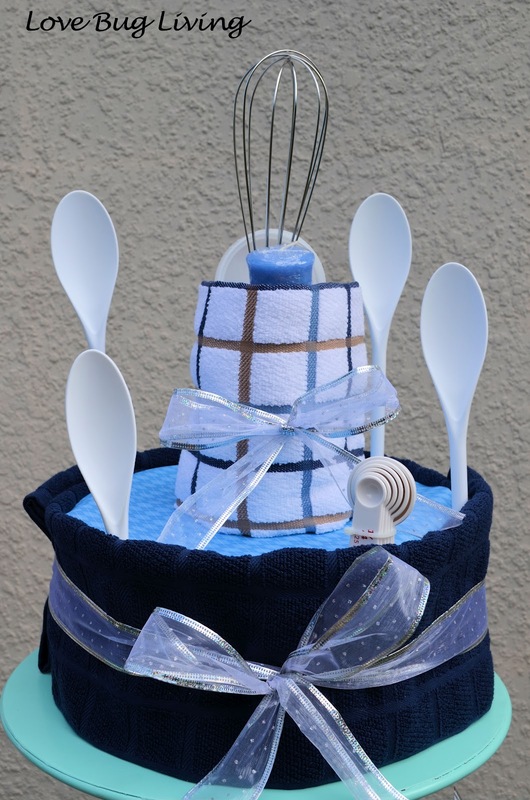 With this Wedding Shower Towel Cake, you can do both! 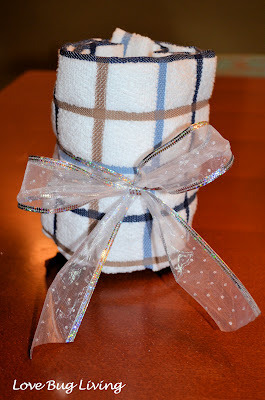 I recently attended a wedding shower for a good friend of mine and I made her this towel cake. I have another friend that also attended and I KNEW I should have checked with her beforewe went. She is quite crafty and makes great gifts as well. I had asked a mutual friend if she knew what she was making our friend, Jen. I told her what I was making, but she didn't think she was making the same thing. However, we were both there with our Towel Cakes! Great minds think alike! We did both have a different take on it though. I wish I had taken a picture of hers, it was super cute! In order to make the Wedding Shower Towel Cake, I purchased some kitchen hand towels as well as some other kitchen gadgets to decorate the cake. Basic kitchen utensils are always great. 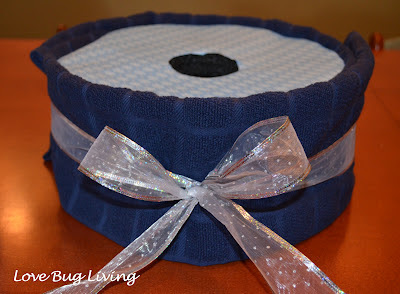 I was using small kitchen towels, but I wanted it to have a bigger cake look. To create this effect, I cut a piece of foam to wrap my towels around. You could also use cardboard boxes for a square cake. 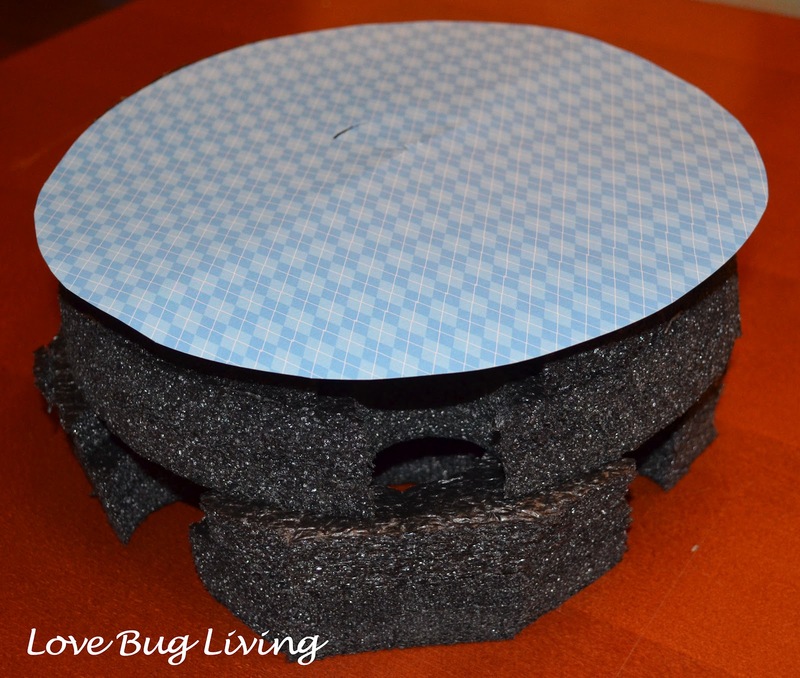 I covered the top of the "cake" with a piece of coordinating scrapbook paper, simply glued in place. You can also choose to make a smaller cake and go without the foam. That's what my friend did and it was adorable. If you choose to purchase bath towels, your cake will definitely be bigger and you won't even need the foam. After you wrap your towels, tie a ribbon around them to keep them in place. 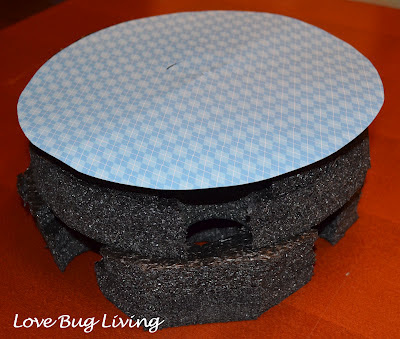 For the top layer, I wanted a hollow center in which to place some of the utensils. I found a tall shaker/measuring cup that worked out well. 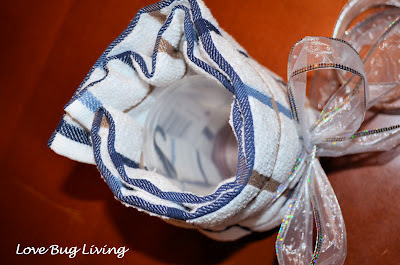 I simply wrapped the towel around the measuring cup and tied it in place with another ribbon. Since I was using foam for the bottom layer, I was able to cut a small hole for the measuring cup to fit into to help the top layer stay in place. You could also use double sided tape to help keep it together. Now it's time to stack your layers and decorate! I slid mixing spoons and measuring spoons between the towel folds. They seemed to stay in place pretty well, but you could always tape them in place if you needed to. It was easy to slide in a whisk and candle into the open shaker/measuring cup in the top layer. 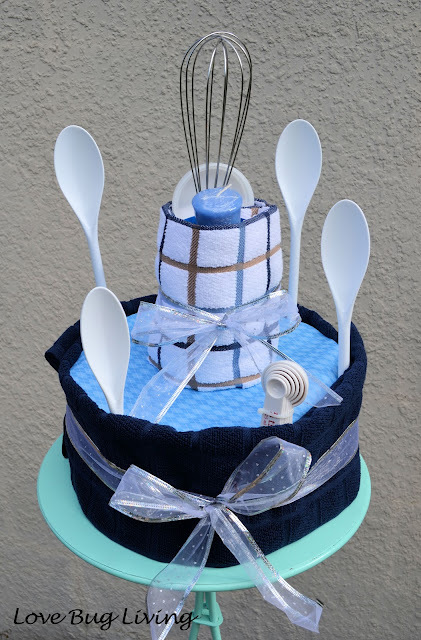 Although it's not in this picture, I did place my towel cake on top of a cardboard cake base to keep it sturdy. Next time you're shopping a wedding registry, be creative in picking out items to create your own cake. Now I have to figure out what to create for my other crafty friend since she is actually getting married as well!